Inside the motherboard box you will find your accessories which may include video adapters if applicable, extra cables, and all of your software. Not all accories are used that are included with your system. You will have extra items to allow for future expansion of your system. Review the printed documentation included with your system prior to setup. If you have any questions do not hesitate to call, we will be happy to help you. 1. If you also purchased a monitor mount, assemble the mount first and attach all monitors to the mount. Instructions and hardware are included with the mount. 2. Unpack your QuadStation System, and all accessories. 3. Connect all the necessary video cables and / or adapters for the number of displays that you are using starting with the TOP video card. 6. Turn on the system. If you are using DisplayPort monitors you will not need the pigtail adapters. You will connect DisplayPort cables directly from the video card straight to your monitors. This is the best type of video connection you can have. 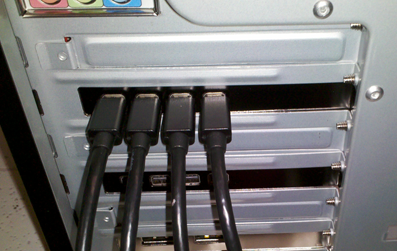 More on DisplayPort. If you are not using all of your displays at first, that is fine. For example if you bought a QuadStation 8 but plan on using only 6 displays right now, not a problem. Just make sure to connect your displays starting with monitor #1 which should be numbered on the back of the video card(s). There are different types of video connections on the back of the video card. The most common are Mini DisplayPort connections which look like the pics above. Refer to the Start Guide that came with your system for step by step details on how to set screen resolution and adjust your displays. 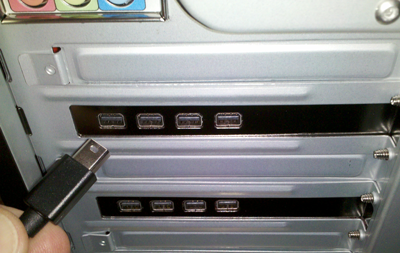 If you are not using all of the displays at first, simply leave the unused video ports disconnected. The software will automatically detect and disable those ports in Windows.